It’s easy to miss Cork Hill, a short street connecting Lord Edward Street and Dame St at City Hall. I measure its length at 35 paces, and although I am tall, I reckon it must be one of the shortest streets in Dublin. Cartophiles will correctly argue that it is a little longer, as the hill officially includes the plaza to the right of City Hall, connecting Castle St. Whatever its length, this short dog-leg joining Lord Edward, Dame, Castle, and Parliament streets is packed full of history; no surprise given its location adjacent to the Castle. As Maurice Craig puts it, it was very much at the centre of things. The street itself takes its name from the Earl of Cork, after he built Cork House there in the early 1600s on the site of the present City Hall. Cork House was itself located on the site of the church St Mary del Dam, from which we get the name of Dame St. Also known as the Great Earl, Richard Boyle was a self-made man who took advantage of the plantation of Munster to make his fortune. Having secured the favour of Elizabeth I, he collected political titles, becoming Privy Councillor for Ireland in 1612, and Member of Parliament for Lismore in 1614. The Irish Parliament was held in Dublin Castle at the time. The area around Cork Hill as captured by Rocque on his map of 1757. Tempting as this short commute might have been, it doesn’t appear that Boyle lived in Cork House. The building was occupied by the Royal Exchange until 1683, when that operation moved to the Tholsel nearby (just visible on Rocque’s map, above). It subsequently became home to a variety of traders; most notably printers and coffee houses. Lucas’s Coffee House, one of the most fashionable places to loiter in the city, was one of the last occupiers. pedestrians passing Cork Hill after dark were frequently insulted and maltreated by the numerous chairmen surrounding the entrances to Lucas’s Coffee House and the Eagle Tavern, the waiters of which establishments supported them in those engagements by pouring pails full of foul water upon their opponents. Changes were needed. Trinity College Dublin led the charge at the other end of Dame St by demolishing the Jacobean frontage of college, itself less than 70 years old, and installing the present frontage. Copious plans of the area exist for around 1766 in the Wide Street Commissioners’ archives, lovingly cared for by Dublin City Archives. But before we look at those, an earlier glimpse is available. A pair of maps of the area dated 1751 (showing the alignment at the time) and 1753 (showing planned changes) are described by MacDowel Cosgrave (1918). A section of interest is shown. In this Survey of the present streets leading to His Majesty’s Royal Pallace or Castle of Dublin. Novr 9th, 1751, Cork Hill is clearly visible. Gloriously, this map has the building locations annotated, and inspecting the legend, one finds that Cork House is located at position number 34, sandwiched between Mr Butler, printer (33), and Mr Mear’s mercers shop (35). More exciting is the proposal of 1753. In this we see that the new alignment of what would become Parliament St is proposed – 46 feet wide, running from the river south to Dame St. At the junction, a large square on the south side was planned. This was to be named Bedford Square after the Lord Lieutenant of the time, and there is even an annotation to include a statue in the centre. This was to be of George I, relocated from the old Essex Bridge. Losing out were buildings number 25 (Mr D’Olier, Goldsmith), 26 (Mr John Ross), and 27 (Mr Fords, Print Shop), and one presumes, the buildings around the new square, including Cork House. Extract of the Wide Street Commissioners map (No. 499) of the area around Cork Hill (click to link to Dublin City Library source). ‘A‘ marks the proposed location of the statue. There is a significant number of maps available in the Dublin City Library image collection documenting the Wide Street Commissoners plans for the area, but perhaps the one to select to continue our story here is Map No. 499, shown. This shows Dame Street, Castle Lane (now Palace Street), Swan Alley (now Exchange Court), Parliament Street, Cork Hill, Castle Street, Castle Yard and vicinity. 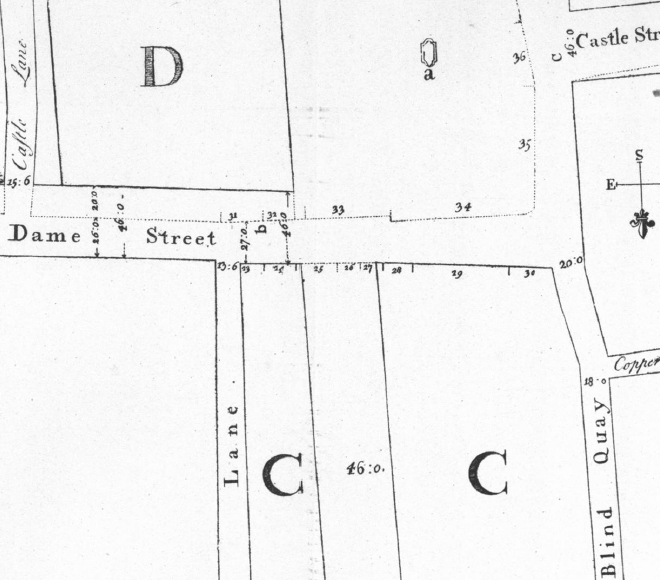 The site of Cork House is now annotated as “Lot from Swan Alley to Cork Hill”, and it is evident that plans for a square and statue of George I were still being considered by the Commissioners. The letter A on the map marks “a pedestal for the Statue of his Majesty George I which faces Parliament St and Castle St.” Parliament St is now shown, with “New Buildings” lining either side. 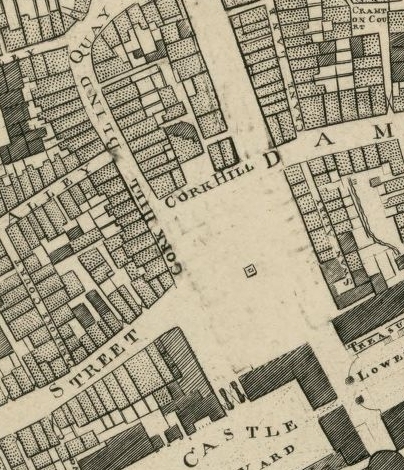 The intention to complete the square obviously convinced Rocque, who in his 1756 map showed the square, to the south of Cork Hill, complete with statue. The square itself looks like Rocque rubbed out previous engravings of existing buildings. His 1757 map shown at the top of the article corrected the prediction. As we now know, the square was never built, but Cork House was demolished in 1768, and City Hall construction began the following year. The infamous approach of the Wide Street Commissioners on Parliament St is well documented, when “public consultation” was replaced by unroofing houses in the middle of the night to get people to leave. While it would be some time (and a national rebellion) before Lord Edward St would appear, the area was beginning to take the form we recognise today.